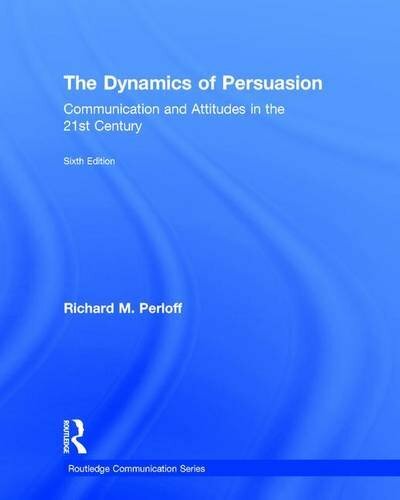 [PDF] The Dynamics of Persuasion: Communication and Attitudes in the Twenty-First Century (Routledge Communication Series) | Free eBooks Download - EBOOKEE! Description: Persuasion is one of the oldest fields of academic study â€“ it dates back thousands of years. In our own era, persuasion has been studied primarily by means of the theories and methods of social science research. Numerous scholars have made contributions to our knowledge of persuasion, and the field has generated a wealth of intriguing concepts and an impressive body of knowledge on persuasion processes and effects. Persuasion is not simply a science, however â€“ it is also an art. Today there is a burgeoning persuasion industry that includes advertising, sales, public relations, political consulting firms, and a host of private and public companies that seek to change attitudes and influence social behaviors. USE SECOND PARAGRAPH ONLY FOR GENERAL CATALOGSâ€¦ Written to enhance students' understanding of persuasion theory and its applications to everyday situations, this book presents an up-to-date review of persuasion theory and research. Attempting to show students how these theories can deepen our understanding of how persuasion is practiced in a variety of real-life situations, it is designed as a text for undergraduate students who wish to know more about concepts of "attitude" and "persuasion," as well as introducing graduate students to theory and research in the field of persuasion. With a broad look at persuasion research, this volume examines psychological approaches to persuasion, interpersonal communication theories, and the interface between persuasion and mass communication, in particular mass media information campaigns. It examines research on cognitive processing of persuasive messages, compliance-gaining in interpersonal contexts, and the effects of large-scale health communication campaigns. No comments for "[PDF] The Dynamics of Persuasion: Communication and Attitudes in the Twenty-First Century (Routledge Communication Series)".